The Little Things - TADSA - Technology for Ageing and Disability (SA) Inc. Some TADSA projects can be very involved and challenging taking hundreds of hours to complete, while others are less complicated and can be completed in an afternoon. What they all have in common is that they improve the quality of life of the clients who receive them. 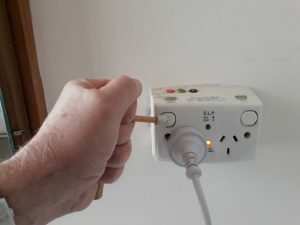 It’s hard to imagine that two pieces of dowel and a rubber stopper could be called assistive technology but if it helps you to push buttons on your phone and remote controls or turn on light and power switches, that’s exactly what it is. 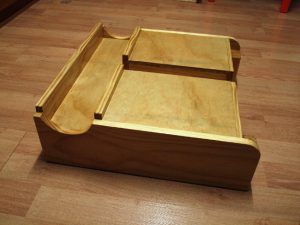 This ‘button pusher’, which is used with a clenched fist, probably took only a few hours to make but made all the difference to the client. 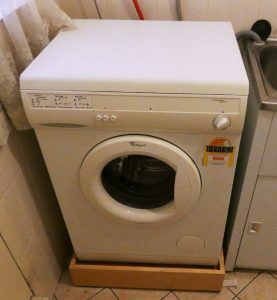 A client with a spinal disease had a washing machine which was too low for her to use. 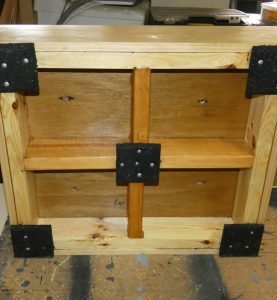 She asked TADSA for a solution and that was to raise the machine 100mm through the use of a wooden plinth. The TADSA Volunteer even thought about vibration and put pads on the bottom of the plinth made of recycled rubber. A TADSA Volunteer was asked to create an aid to assist a client with cerebral palsy who was having difficulty putting on/taking off shoes and socks. 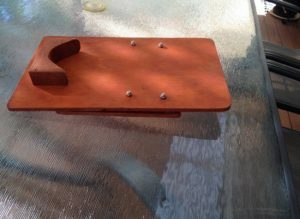 The device was to be used at home and taken on holiday, so it had to be light weight and sturdy but small enough to fit in a suitcase. The solution our Volunteer came up with was an angled platform. 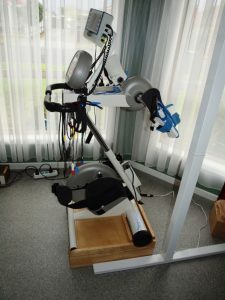 A client who lives with quadriplegia uses an exercise cycle while in his wheelchair but the cycle needed to be raised 120mm. 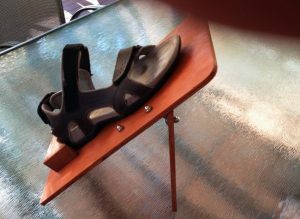 Our Volunteer designed and manufactured a plinth to solve this issue.